MBL News is the leading trade magazine for butchers. 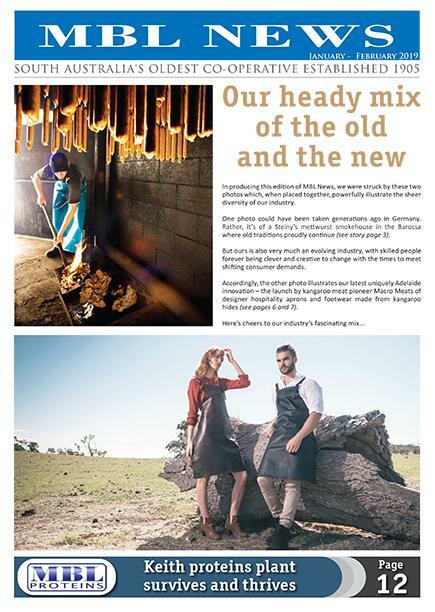 In this edition,we look at creative diversity in todays Butcher trade, including the launch by kangaroo meat pioneer Macro Meats of designer hospitality aprons and footwear made from kangaroo hides, as well as Andrew Mills transition to butchery after the loss of his poll merino stud in the catastrophic Wangary bushfire in 2005. Tash and Scott Goldsmith, owners of Steiny's Traditional Mettwurst have been given a massive boost by the instant success of their new tasting room for traditional Barossa mettwurst at a trendy food and drinks hub in Nuriootpa. They were stunned by a huge response which saw 5000 people visit their tasting room in the first three months after opening, giving them the confidence to tackle beckoning interstate markets.